The Nature Of The Beast: How should journalism be defined in Twenty-First Century New Zealand? WHAT DOES IT MEAN to be a journalist in Twenty-First Century New Zealand? Why do thousands of young people every year sign up (and pay for) tertiary courses in journalism and communications studies? It certainly isn’t for the journalist's starting salary. Modern journalism is a high-stress, unrelenting, poorly-paid and (if the trust and confidence surveys are to be believed) almost universally despised profession. Why bother? The oldest and still the most common answer journalists, both real and aspiring, offer to those who ask this question is: “To make a difference.” Ever since the invention of the printing press, people with something to say have seized the opportunity communication technology provides to reach a mass audience. In other words, people become journalists to access the power of the media. Their motivation is political. Most journalists are loath to admit that power and politics have even the slightest bearing on their reasons for joining the profession. They’ll object that their motivations were much more honourable than the crude pursuit of power. Many will insist that they were only interested in sharing information with the public. Some will say they joined to right wrongs and correct abuses. Others will plead simple curiosity – an overwhelming need to know what’s going on. They should not be believed. The first thing that any journalist encounters – no matter whether he or she is in print, radio, television or web journalism – is their new employers’ editorial culture. This will determine practically every aspect of their job. If they’re interested only in gathering and disseminating information, the editorial culture of the newspaper, magazine, radio station or TV network will very soon make it clear which information is to be gathered and disseminated and which is best left alone. If they’re out to slay ogres and dragons they’ll be told which ones are fair game and which ones to leave undisturbed. If they’re simply curious they’ll learn very swiftly that there are institutions and individuals about whom it is positively dangerous to ask too many questions. 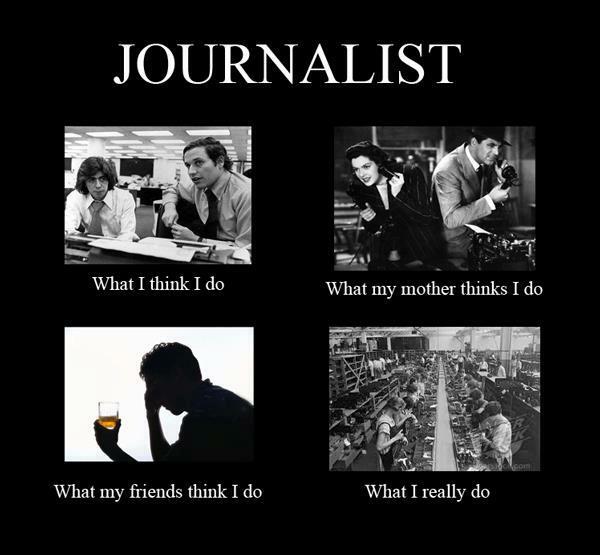 Every journalist entering the profession, therefore, has a choice. Submit to the culture, or walk away. That so few choose to walk away speaks volumes about the professional temperament of journalists. The thrill of reaching and influencing a mass audience trumps just about every other consideration. As is the case with all mercenaries, money is important to the working journalist – but it isn’t crucial. They do what they do because nothing else comes close. Who cares if the issues being addressed and the editorial line being followed are dictated by somebody else? It’s the journalists’ words, and their images, that make the difference on the ground. If you remain doubtful that journalists are essentially power-seeking politicos with keyboards and/or cameras, just consider the twenty-first century “communications” career-path. In the process of making a master communicator journalism is only the apprenticeship phase. A few years of “churnalism”, of demonstrating that he or she possesses a safe pair of hands, and the apprentice is taken up into the public relations industry. Providing there’s nothing in the journalist’s career suggesting some unwillingness to embrace the culture of their paymasters, the shift to PR work will generally double their income overnight. In this world there’s no place for idealistic self-justifications. Here, the journalist’s talents for effective communication are to be placed unashamedly at the disposal of corporate power – end of story. An alternative path to becoming a well-paid shill for the rich and the powerful is via the offices of Government and Opposition politicians. For ambitious members of the Parliamentary Press Gallery, becoming a “spin-doctor” is easily the quickest route to a six-figure salary. It does, however, require a solid grasp of the realities of political reporting: hunt as a pack; share the spoils; and under no circumstances attempt to write your own words or music to the unfolding drama. Above all else, the successful political journalist understands and accepts that democratic politics can only be about the replacement and replenishment of elites. Faces may come and go, but the fundamental story must always be the same. Politicians and journalists who attempt to construct and/or popularise a political narrative substantially at odds with the version provided by “official sources” should anticipate neither a lengthy nor a successful career. This examination of Twenty-First Century New Zealand journalism cannot, however, be concluded without a word or two concerning the glittering exceptions to the profession’s new rules. These are the celebrity journalists – the handful of political editors, presenters, news-readers, talk-back hosts and entertainers who dominate the electronic media and are, thus, the principal shapers of public opinion. Like the actors of Ancient Greece, their role is to demonstrate how little we human-beings control the urges and forces that shape our universe. To explain, in short, the ways of gods to men. In the Twenty-First Century these deities are the great private and public organisations to which most of us offer up our daily labour. Through the celebrity journalists' own carefully constructed masks and most particularly through the heroes and heroines they create, we are invited to participate vicariously in both the comedy and tragedy of the human condition. In their stories we learn to recognise hubris and hamartia, the overweening pride and the fatal flaws, that first raise up and then cast down the dramatis personae of our ruling elites. What they dare not do – on pain of themselves being cast down from the electronic Olympus – is encourage their audience to believe that the greatest story of all; the story yet to be written; is the story ordinary people will one day write for themselves. And Patrick Gower just proved your point by smearing Justice Binnie on 3 news because he made a couple of typos, whilst ignoring the substance of the issue. This is why I no longer believe in freedom of the press. The press just use it to abuse it, and they make sure that important issues are ignored. It's an entirely redundant privilege. Gulp! Sorry about the howler, folks. Duly corrected. Chris, you speak somewhat messianically of "the story yet to be written; is the story ordinary people will one day write for themselves". It has not happened since Gutenbergs printing press, so when and why? Please expand. I think pundits become just as arrogant as journo's. Maybe not quite as much as pols. I sat through a long (and I have to say unfortunately wearisome)lecture delivered by Noam Chomsky some years ago. I forget the exact title of the lecture but it included a an exposition of the role of the media in "manufacturing consent" in the age of globalisation. Where Chomsky is a riveting but extremely complicated and demanding read (but almost impossible to listen to :) ), Your brief essay captures the essential ideas in a nut-shell. Well done! ""It's kind of venial sins versus cardinal sins basically ... where reporting is very, very important and journalism is very, very important, and there are some things about campaign coverage that I might critique. Whereas punditry is fundamentally useless." Well, I obviously beg to differ with the extraordinary Mr Silver who confesses, I recall reading somewhere, that even he relies on human intuition when the numbers cannot take him any further. I do agree with him about the "punditry" of the American Right, however. Their performance during the recent US elections was indeed "fundamentally useless". Well you've obviously misinterpreted what he has to say. Which pretty much legitimises his conclusion. Intuition isn't necessary for punditry. This is a serious topic and it attracts eleven comments (and one of those is me posting twice in error oops).